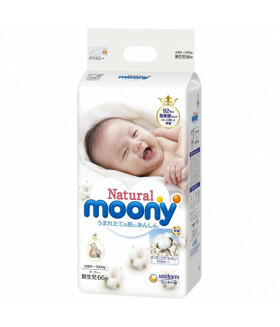 Japanese diapers Moony - Many parents find them the best among Japanese diapers. The skin of the ne..
Japanese diapers Moony - Many parents find them the best among Japanese diapers. The skin of the new.. 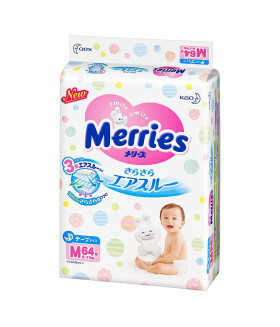 Speaking about diapers Merries, produced in Japan, they have excellent customer reviews. These dia.. Speaking about diapers Merries, produced in Japan, they have excellent customer reviews.These diaper.. In 2011 in Japan, among products for the care of children, diapers and pull-ups GooN brand was award..
For the delicate skin of babies weighing up to 3kgTo ensure healthy skin and prevent rashesThe Wor..
Our online store at The Best of Japan only sells the best brands of Japanese diapers. Why buy diapers like Merries, Moony, and Goon? The superabsorbent polymer is safe for babies and the environment. It is biodegradable and requires less wood pulp for absorption. These products are ecologically certified for achieving the highest level of quality and environmental safety requirements. Your baby will not be exposed to chlorine as a bleach nor fragrances and lotions. Compared to diapers made in the USA, these are more ecologically pure and natural. Merries diapers are safe for newborns and infants alike. The Japanese diaper has focused on the gentle to skin concept based on skin research. Diapers can absorb a lot of wetness, which makes it even more likely to cause irritation and rash. A Merries diaper has a wetness indicator that helps caregivers know when it is time to change. Its absorbent, soft material prevents leaks, even overnight but is breathable so that it doesn’t stick to your baby’s skin, even when it gets stuffy inside. This is from the three layer air-through system keeps your baby’s delicate skin dry and soft. 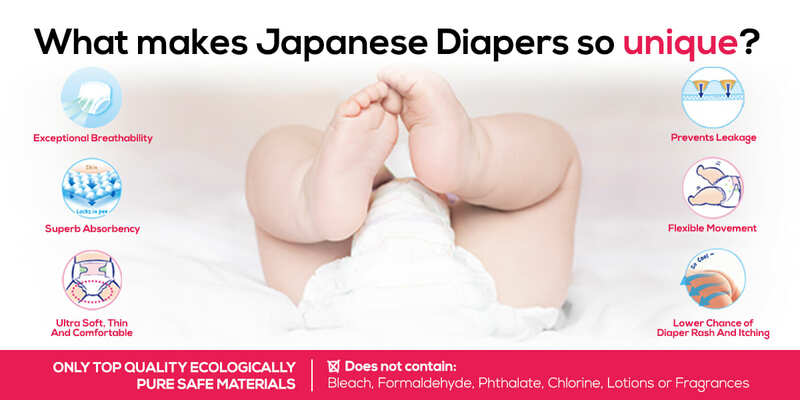 Merries diapers are non-toxic and eco-friendly. You and your baby will be happy with its softness and performance of the wave surface that traps poo away from the skin. Moms around the world are in awe as to how well Merries diapers absorb moisture, even overnight. 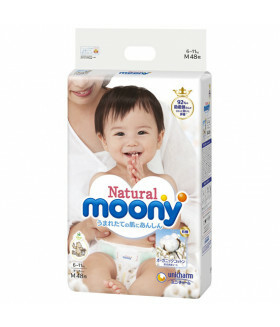 Moony diapers are perfect for your baby's delicate skin and one of the best for preventing leaks. The surface sheets are made with organic cotton that are free of petroleum-based oil. Urine can stay absorbed for up to 12 hours, which keeps your baby drier through the night with no leaks on the bed. It is easy to know if it is time to change your baby's diaper by the indicator line. When the diaper is wet, the line will change from yellow to bluish green. The special wavy absorbing zone in most sizes capture poo so that it doesn't irritate your baby's bottom. The Air Fit design of the Moony diapers means that it is curved to fit your baby without an squeezing from elastic sides on the legs and tummy. These diapers are easy to use so changing your baby is quick and simple. Even the sides can tear in case of big cleanups. When you are looking for premium diapers for your baby, Goon Diapers from Japan will meet your needs. It won the Mother's Choice Award in Japan in 2011. One of its impressive features is that it fits your baby from small to large, up to 77 pounds. Since your baby is born with sensitive skin, it is important to protect it from the moisture that gets trapped in diapers. Goon lines their diapers with Vitamin E which is naturally beneficial to skin health. Your baby will be dry and rash free no matter how sensitive their skin is. These diapers perform well when it comes to absorption and air flow, which is surprising for its thin design. For older babies, the larger diaper sizes have an elastic belt that allows for baby's movements without any tight squeezes. These super-absorbent diapers have been making moms happy in Japan and beyond. When you buy your favorite Japanese diapers from our online store, you can get Merries, Moony, or Goon at low prices. We offer great discounts and special promotions to make it more affordable for you. With fast delivery in the USA, your baby will be dry and comfortable in no time. If you are not sure about which product is right for your baby, we are happy to assist you with your decision. Call us or contact us through the website and see the difference.